I like to think that I have the mind of an entrepreneur. I’m always looking for creative ways to solve problems and have always dreamed of starting a business. That dream is about to become reality. I’ve had to keep it a secret until now. However, today I am able to tell you about my spanking new business! A couple months ago, I wrote about how the poor residents of my town were suffering. At the local fitness facility, they were forced to park in the overflow lot, making them walk an extra 100 feet. My townsfolk were not happy and who can blame them? No one should be expected to put up with extra walking at the gym. What has the world come to? My brain started churning. How could I help these poor people? I quickly came up with a solution, but it didn’t stop there. The ideas flowed and before I knew it, I had come up with a whole roster of services to make life easier at the gym. I wrote up a business plan and presented it to the manager of the facility. He enthusiastically embraced my vision which I present to you today. 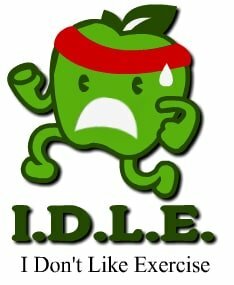 I’m proud to introduce my new company, I.D.L.E. (I Don’t Like Exercise). We are all stressed these days. We have awful jobs, crabby spouses and unruly children. We never have enough time for TV, video games or a heaping pile of nachos topped with heart clogging, fake cheese. On top of all this misery that life throws at us, we’re expected to exercise too? Come on now. I created I.D.L.E. to make life easier at the gym. Through a menu of services, I guarantee that you’re going to start enjoying your gym time. Valet service: Who likes to walk? No one! Now, you don’t have to. Drive up to the front of the gym and let a valet do all of that walking for you. This service will cut precious seconds off of the parking lot walk which you can now use for walking on the treadmill. You’ll wonder how you lived without I.D.L.E. valets. Segway rental: What is even worse than walking? Running. If you say that you enjoy this torture, you’re clearly lying. It’s pure awfulness. 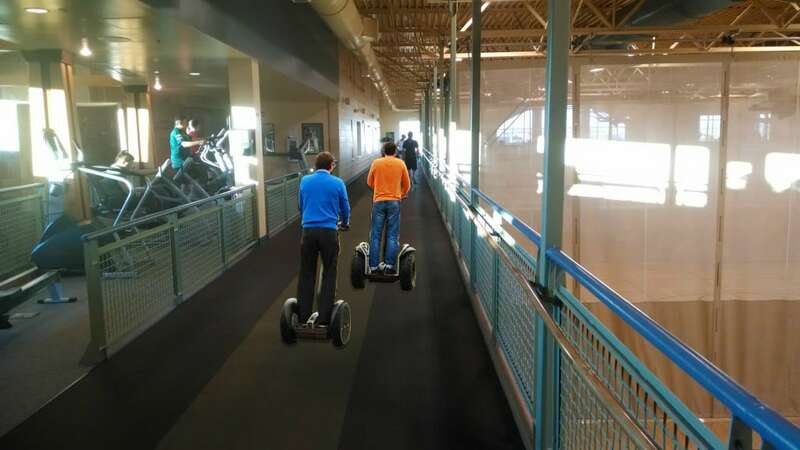 With our Segway rental service, you’ll be able to “run” your laps in style! It doesn’t stop there though. We’ve outfitted the Segways with super-sized drink holders (64 ounces baby!) After a couple laps on one of these machines, you’ll wonder why you ever ran. Neighbor: How was your workout? You: Awesome! I did 100 laps! 8 miles baby! Neighbor: Whoah! You are a fitness god! Snack Bar: I know what you’re thinking, the gym currently has a snack bar. But it’s stocked with food no one wants to eat. Granola bars? Vegetables? That stuff is for rabbits and horses. I.D.L.E. will take over management of the snack bar and the first thing we’re going to do is overhaul the menu. Goodbye nuts, hello funnel cakes! Goodbye Gatorade, hello 64 ounces of Mountain Dew. No diet items here, either. Pure cane sugar, just like it should be. After a couple laps on the Segway, treat yourself to a piece of pizza or hot fudge sundae. You deserve it! Workout stand-in: You don’t change your own oil. You don’t mow your own lawn. Why are you still doing your own exercise? For a low monthly price, I.D.L.E. will provide you with an athlete who will do your exercise for you. Imagine sitting at home watching TV while your stand-in lifts weights, rides the exercise bike and swims laps for you. Incredible, isn’t it? For an extra $25/month, upgrade to a cheerleader or football player from the local college! I can’t tell you how excited I am about this new venture. Going into business marks a new and exciting chapter in my life. I love the fact that my business is going to help the people get to the gym (or not). And this is only the start. I’m in talks to franchise I.D.L.E. and I dream big. Soon, I.D.L.E. will be partnering with a gym near you. Mention this post for 25% off the first month and a free churro from the snack bar! I thought you were serious… But it just kept getting more crazy! Right on! Investors in the first round will get a Segway named after them and unlimited churros the first year at the snack bar! Damnit!! You got me until the Segway part. Even though I knew what day it is today. Although, if you decided to start up a new business it would definitely not surprise me. I think you have the drive Mr 1500. All the best to you and your family this April Fool’s day. I’m a huge fan of your blog. Hah! Oh those poor people in your town who must walk to the gym… now they must go through the trauma of registering for your program too–the horror ;)! For an extra fee, we’ll register for them! Hilarious – Happy April Fool’s Day! Hmmmm, how can we make this work? Come on, you and Mr. PoP have entrepreneurial minds! We can make it happen!! YES! Just send me a big check and you’ll be first (and probably last) on the list! The fatal flaw in the description that clued me in to the April Fool’s Day joke was “pure cane sugar.” If this had been real, it would have been “high fructose corn syrup.” Other than that, you may be on to something. No joke. You had me at super sized 64 oz of Mountain Dew, dreams can come true. You had me for until I saw the logo, good work. I know, I love Mountain Dew. That is not a joke. I avoid it though because I like having teeth. As silly as this is, I bet a valet would work. People get so stressed about parking their car. It also cuts into their allocated workout time. Who wants to start a work out stressed and short on time? You could be their solution! And I’ve always wanted to ride a Segway. People ask me what gym I go to in NYC. When I tell them it is 10 blocks from my apartment, I get some weird looks and responses like “isn’t that a hike?” or “Planet Fitness is 3 blocks away!” COME ON PEOPLE! Man, I have to tell you that I love walking. I try to do a mile or so at least every day. After I quit, it will be more like 5 miles. I thought it was a great idea, right up to the point where I have to sign up for the services myself. Hello! Shouldn’t I.D.L.E.’s customer service reps do that for me? I wish I liked running, but I’m just terrible at it. Perhaps I’ll give it a try again soon. The biggest shame of all is that this business would do really, really, really well here in the US. People look at me like I’m crazy when I walk 0.5 miles to the grocery store and back. We live in a strange world. Dunno about you, but I love walking! Once I leave my job, I plan to start and end every day with a nice hike around my ‘hood. Great idea, you should definitely become an entrepreneur! Where can I sign up to invest? Soon! Just send me the biggest check you can muster!! ROFL I bet you’re going to make tons and tons of money with this new business. Hilarious! You really had me going for a moment! I think the only true part of this post is, “We have awful jobs, crabby spouses and unruly children. We never have enough time for TV, video games or a heaping pile of nachos topped with heart clogging, fake cheese.” :p I just want to know if it is Mr. or Mrs. 1500 that is the crabby spouse? Happy April Fools Day to you all at 1500days! Ha, it is Mrs. 1500. She is quite the crank. Did I mention that I’m sleeping in the garage tonight? LOL This is good stuff. Reminds me of the escalator going up to the gym which is terrible since it actually exists!